Podcasts are an excellent tool to help keep you current in today’s rapidly changing world of higher education marketing. This post will share some basic background on podcasts for beginners and provide my top six podcasts for higher ed marketers recommendations for you to check out and get started. I discovered podcasts a few years ago. Since then, they have become a critical piece of my personal approach on how to manage the internet “information fire hose” and keep up-to-date on how to build the best marketing solutions for the fields of marketing, higher education and technology. Even though podcasts are certainly not new, I am always amazed at how many of my time stressed colleagues have not considered using them as an information and learning resource. Recent stats report, that only about 44% of people currently listen to podcasts. If you are already into podcasts, skip down a couple of paragraphs to get to my specific podcast recommendations. If you need a bit more help getting started, read on. The value proposition of podcasts is pretty simple. Podcasts allow you to capture, time shift and then consume really thoughtful and detailed content. It ranges from research, discussion and analysis of pretty much any and every topic you are interested in. ….And trust me, there are podcasts about everything! Once you start listening to podcasts, your personal commute, your workout, walking the dog or even cleaning the house will never be the same again. Personally, they’ve had their biggest impact in my life over my 1 ½ hour commutes in and out of the very busy city of Toronto. Over the course of any given week, I will typically listen to up to 12 hours of precisely curated podcast content. Most of it is for professional development but I do slip in a few shows purely for entertainment as well. On some days that feels like a lot of listening but mostly I am left with the feeling that I have been given keys to kingdom and want more. But back to the details at hand for those of you who are not using them yet. It is very simple to get started with podcasts. First step is to download a podcast reader to your smart phone. 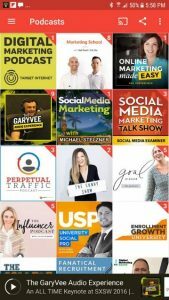 If you are looking for a recommendation on a podcast reader, I personally like Pocket Casts or Podbean. Pick one and go for it. Once it’s installed, start searching for podcasts about your interests and start downloading them. If you need more help on how to do this, here’s a primer on setting up a reader and listening to podcasts . The following are my six favourite go-to podcasts. Three cover the general world of marketing for higher ed (marketing, recruitment, and admissions) and three are from the more specialized and technical side of digital marketing. I recommend you give them all a listen and that at least one will resonate with you. I think they’re all really quite good. Produced by mstoner in Chicago, Highered Live is a particularly impressive enterprise of podcast content production. It has “sub-channels” for admissions, student affairs and marketing, and is nearing its’ 500th episode. It includes great interviews, panels and discussions of practicing higher ed professionals with lots of useful business and marketing strategy, tactics and insight. From Helix Education in Denver, this podcast covers a wide range of topics from web, branding, marketing, recruitment to admissions with a focus on enrollment growth. I like the organic feel to this one, with lots of grassroots examples on which to model your strategy and tactics. From ecityinteractive in Philadelphia, this podcast covers a wide berth of higher ed marketing topics similar to the above but with a bit more emphasis on admissions and alumni marketing. Not quite as well established as the others but producing some good stuff. From Target Internet in the UK, this is one of my favourite digital marketing podcasts. I genuinely look forward to it every week. They produce a wide range of excellent materials, including blog, podcast, and public and corporate training courses in digital marketing. From Social Media Examiner, Poway, California, this powerhouse shop is the go to place for all things social media. Their conference, blog, podcasts and live video shows are all excellent and will keep you coming back. Micheal Stelzner’s podcast is usually a deeper dive into one main topic with a guest. The Social Media Marketing Talk Show provides late breaking news from across all social media. I follow both and recommend you do to. Digitalmarketer.com was very early in the digital marketing game, around since 2003. They run an excellent podcast covering the gamit of topics in search engine marketing, social, PR and content marketing. I particularly like their audits of sites and campaigns, where they provide a useful analysis of strategy and tactics used and identify strengths and weaknesses of the creative. So that’s my top six list. If you are still skeptical about the value of listening to podcasts, check out a couple of these for a week or two and I guarantee you will be hooked. Of course this list only scratches the surface of the many great resources out there, so start digging and you are sure to find a lot more gold. Please let me know what your favourite podcasts are, in the comments section below. I will give them a listen and assuming I agree, get them on to my list of best podcast resources. Thanks.